This book was the September selection for my book club, the local chapter of Reading Liberally. Unfortunately, the member who proposed the book wasn’t able to come to our discussion, so we weren’t very lively, but I found the book fascinating. Kolbert writes for The New Yorker and I gather that many of the chapters had previously appeared as essays in that magazine, which is why, perhaps, the book doesn’t quite hang together as a single argument. 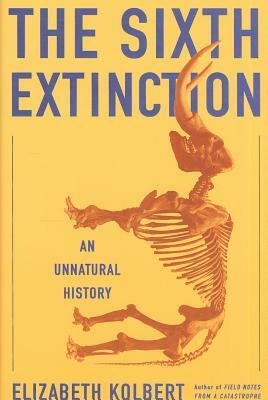 Still, the individual pieces–about mass die-offs of amphibians in the tripics and bats in New England, the extinction of ancient species as well as modern species, and the rapid changes that are occurring in biodiversity and the environment–are startling. She tells a compelling story about some frightening things that are happening right now and along the way draws parallels with the mass extinctions that have taken place in the past. One of the members of our group complained that the book didn’t, in the end, make a case for anything, or didn’t tie this large body of evidence together in order to draw a conclusion about what’s happening on our planet. That’s a fair criticism, I think. In the hands of another writer, perhaps, an argument for taking action might have been made, or we might have seen predictions about the future if nothing is done. Instead, the reader is left to draw his or her own conclusions. Kolbert shows what happened in the previous mass extinctions and presents evidence that suggests the current extinction, which has been going accelerating since the appearance of humans is even worse. My own expectation is that the human species is not threatened with extinction because we will find a way to survive and adapt even while we kill off everything else. That’s not a particularly cheery thought, though. Maybe we should start over on another planet and get it right this time. A friend of mine said we are a virus on the earth but it will win out in the end. I tend to agree. I’m frustrated that few people realize or want to learn about factory farming and what it does to the environment, to say nothing of the unspeakable cruelty to animals. Your conclusion is hopeful. Humans will survive. But at what expense? Will we live in a controlled, indoor environment? Cut off the nature? Which, in my opinion, is the source and nurture of soul. But sign me up for a new beginning on another planet. What an adventure! And hopefully our collective unconscious will get it right. Look again at my conclusion. I don’t think I couched it in very hopeful terms. Okay…hopeful was a stretch. Rather than giving up, we need to find solutions. The demise of planet earth would be a catastrophe beyond bearing.